A Golden Opportunity of a Lifetime! “Brick by Brick” was the slogan and the operative word that attracted funds and donations for the completion of the wondrous edifices of our national heritage, Lovamahapaya, Mirisavetiya, Ruwanmali Maha Seya, Abhayagiriya, Jetavanaramaya and Thuparamaya that forever changed the skyline of the Holy City of Anuradhapura 2000 plus years ago! Devotees may dedicate Golden bricks in remembrance of those deceased and in honor of those living as well! ONLY A LIMITED NUMBER OF GOLDEN BRICKS AVAILABLE! RESERVE YOURS EARLY! In order to qualify for the mortgage and commence construction activities, we required to raise $ 500,000. At the request of the devotees, the Golden Brick Wall program was initiated to raise these funds. 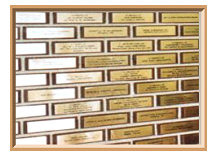 Each Golden Brick is priced at $500.00 to achieve the sale of 1000 bricks. We are pleased to inform you that to date over 600 bricks have been acquired. Any funds received from Golden Brick reservations after commissioning the building will be utilised to pay off the building mortgage. Please make your reservations at the West End Buddhist Cultural Centre by selecting any of the following methods of payment. 2. By Cheque - in favour of "Halton-Peel Buddhist Cultural Society"
3. If you are unable to physically visit the Temple or post the Cheque, you can pay by Credit Card through our Credit Card Processing Partner "Canada Helps" http://www.canadahelps.org/CharityProfilePage.aspx?CharityID=s70731 (please make sure that you select immediate Payment and add a comment about the name(s) that the Brick(s) are dedicated to i.e. In Memory of .................. or Dedicated to ......................................). Halton-Peel Buddhist Cultural Society will issue Tax Receipts for all the paid reservations. The Halton-Peel Buddhist Cultural Society reserves the right to limit the number of Golden Bricks in order to give opportunity to a wider audience. Do not be late and regret, make use of this once in a life time opportunity today.